I have long believed in the power of food to cure many illnesses and have witnessed the powerful goodness of good old chicken broth to cure many an ailment. Nourishing broths date back to the Stone Age and until modern age most households kept a pot simmering over the fire. People regularly ate from it and added to it whenever ingredients became available. I’m guessing that’s where the saying “throw something into the pot” comes from! While broth and soup making ingredients and techniques have changed over the years, what has remained constant is its use for health and healing. 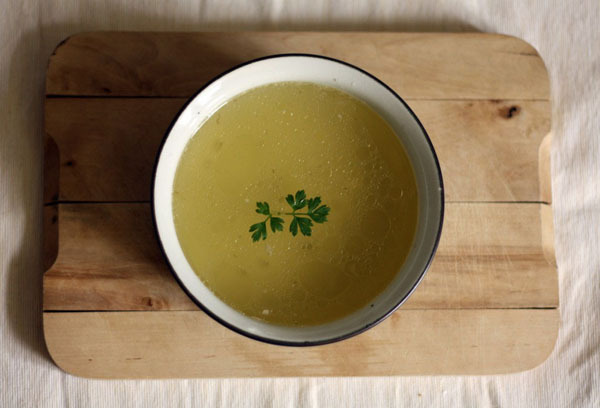 I’d like to share a Chicken Broth recipe with you. This recipe makes 3.5 litres. I use whole chicken however you can also use the carcasses from roasted chickens or necks, backs and wings. It is important to source your bones carefully. The best bones are from 100% pastured reared chickens. Seek out a local producer or find a reputable resource online. Put the chicken (or carcasses) in a pot with 3.5 litres of water; add the chicken feet and heads and vinegar. Let it stand for 30 mins so that the vinegar can leech out the minerals from the bones. Add the veg and turn on the heat. Bring to the boil and skim the scum. Reduce to a very low simmer and cover. Cook for 6 to 24 hours. Throw in the parsley during the last 10mins of cooking. Let the broth cool and strain it. Take any remaining meat off the bones for future cooking. Add sea salt to taste. Eat the broth as is or keep in the fridge for up to 7 days or in the freezer for 6 months. You can use it in soups or stews. For further reading on broths I can highly recommend “Nourishing Broth, An old-Fashioned Rememdy for the Modern World” by Sally Fallon Morell and Kaayla T. Daniel, PhD, CCN where they explore broths’ role for the prevention of diseases like osteoarthritis and rheumatoid arthritis, scleroderma, psoriasis, cancer, colitis and other digestive disorders and its use in anti aging and sports medicine.